Driving along the freeway, LAPD Sergeant Shane Scully glances over and sees at the wheel of a neighboring car his oldest friend and LAPD colleague, Jody Dean. Why is Scully so surprised? Because it's been two years since Jody committed suicide. Now Shane is confronted by the bizarre truth: Jody and five other cops thought to be dead are anything but. Originally sent deep undercover to bust an extremely violent international criminal network, they've gone bad. Calling themselves the Vikings, they are LAPD's worst nightmare: dangerous rogue cops who know how the system works. 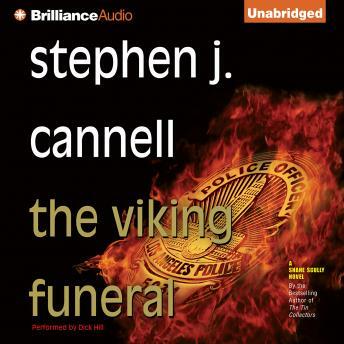 Full of the high-wire suspense and wonderful characters that made The Tin Collectors a bestseller, The Viking Funeral brings Shane Scully back into action, pitting him against his closest childhood friend, and endangering the life of the woman he loves. This is a fast pace action story by Stephen J. Cannell. When I first started to listen to the story I had thought it sounded familiar but as the story progressed I realized I had not heard or read the story before. A good story full of action for a short commute. This is a really great character! I loved the story line, not your every day event. I hope there will be many more with this character form Mr. Cannell.